In my opinion these three elements are more at work in a connective learning environment than in any other environment. Being connected involves a self-directed learning coping with digital abundance. This digital abundance can’t really represent a problem if the learner is well aware of his own learning styles and modalities, otherwise it can bring to both information and functional overload. I myself being involved in this CCK08 felt those risks, as for example, I subscribed Second Life hoping to change my hedonistic consideration of the medium into a useful one for learning and failed. I tried to ‘re-write’ some material from the course just for the pleasure to contribute a syntesis and felt affected by informal reductionism (What is the point of producing a syntesis when you have the original materials? And what’s more: who am I doing it for?). I like mapping but didn’t find a real sharing in the group up to now. It is an experience in designing courses in Moodle based on social constructivism with two connective features: sharing and being reactive. In the upper left quadrant, you quickly sketch out a picture of a person deep in thought. This icon in the PERSONAL box represents the invisible interior world of the individual: personal awareness and values, personal style and attitudes. In the lower left quadrant, you sketch a hand holding a group or family safely within its grasp. This icon in the TEAM box represents the invisible interior world of the collective: shared values, vision and language, the webs of culture and worldview in which each individual operates. In the upper right quadrant, you sketch a person working. This icon in the PROFESSIONAL box represents the visible exterior world of the individual: personal capabilities and competences, professional behaviours, measurable performance. In lower right quadrant, you sketch a typical urban environment or any environment with visible social structures. This icon in the INFRASTRUCTURE box represents the visible exterior world of the collective: social system, organizational systems, information systems, technical environments and so on in which people live and work. 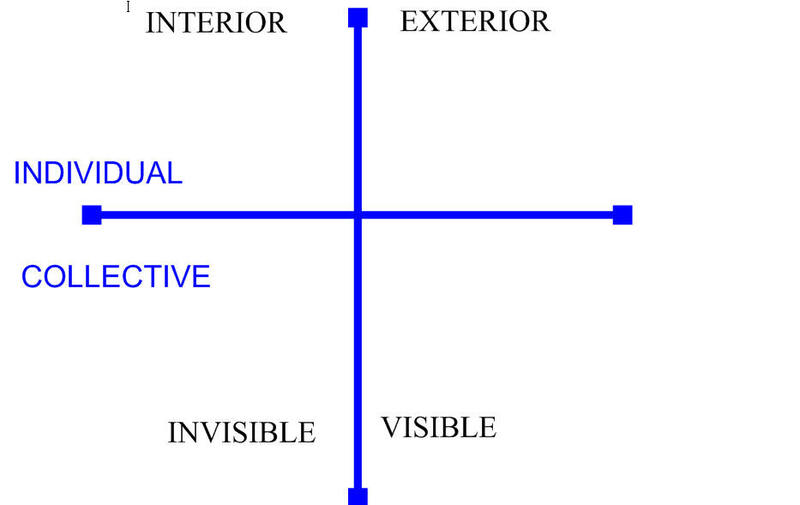 I wonder how connective knowledge might match the individual and collective needs through the four quadrants just sketched. This is my half-formed thought for this week, not really a contribution to the group discussion, I know. It is only an attempt to classify (SOS…need your Help). P.S. Here is a mindmapping reading of Learning Networks and Connective Knowledge by Stephen Downes. We humans are connection-seekers and meaning-makers, creatures anxious to draw parallels with our own being, patterns we see, and what we desire or reject. 1. Is Connectivism a theory or pedagogy? It sets goals for learning which are not simply utilitarian and aim at a whole model of learning including the quest to become better people. What is it that inspires people to change, learn and transform? People won’t change unless they appreciate a pressing need to do so. People need to have the will, ability and potential to make whatever changes are necessary. People need to be given support and consolidation so they can learn new skills in a relatively safe environment with plenty of encouragment. It is necessary to have some idea about where there is a problem (how we teach and design curriculum?) and what alternatives exist to do things differently (what spaces and structures for learning?). The internet represents a substantial change to influence the western world spirit of productivity, utilitarianism and return on investment. Siemens (2004) defined learning as “actionable knowledge” and Stokman (2004) concluded that mutual interdependances influence the potential for interaction or connection forming. I would suggest a story as a contribution. A Sultan invited a mullah to go hunting with him and his entourage. But he gave the mullah a camel that was very slow indeed. The mullah said nothing about this. Soon the hunt had left the mullah far behind and after a short time was completely out of sight. Then it began to rain. It rained very hard indeed. All the members of the hunt got completely soaked. The mullah, on the other hand, quickly dismounted, took off all his clothes, folded them into a neat pile, and sat on them under the camel for the duration of the storm. When the storm abated, he dressed himself and returned to the Sultan’s palace for lunch. The Sultan and his entourage were amazed that the mullah was completely dry, for even with the speed of their camels they had been unable to find any shelter on the plain. They looked at the mullah with suspicion. “It was because of the camel you gave me,” he said. The next day, the mullah was given the fastest camel, and the Sultan took the slow one. Once again it rained. The Sultan, stranded in the middle of the plain, on a camel that moved at the speed of a tortoise, got absolutely drenched. The mullah, on the other hand, repeated the same procedure as the day before. When he returned to the palace he was as dry as a bone. And here’s is my interpretation: The mullah cannot take responsability for what happens in the environment, but he can take responsability for how he deals with the situation. He takes control of his situation, behaves accordingly and this is in marked contrast to the sultan and his enturage. Out of metaphor, who’s responsible for learning in a network? I’d like to hear an example of shared responsability. …and here’s where we all live. A map of the course created by Matthias Melcher. Here is a mapping adaptation from the article by Stephen Downes.